If you're looking for a campsite with bungalows, we'll be glad to give you the warmest of welcomes to Camping Cala Ginepro, our beach campground in the italian island of Sardinia. 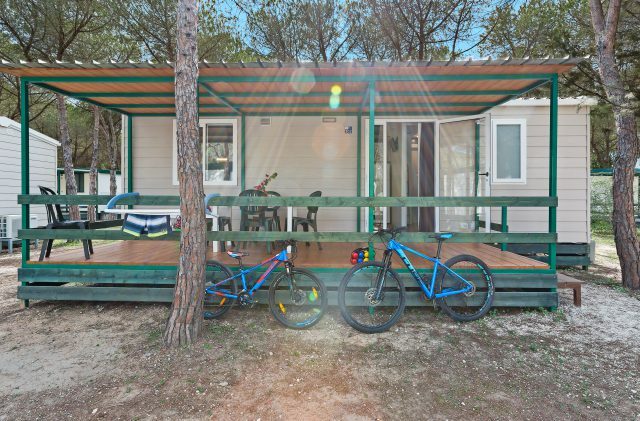 The most recent addition to Camping Cala Ginepro, the superior line Bungalow in Sardinia is a 24 m² mobile home ideal for 5 people; equipped with all comforts, it has five beds in two bedrooms: one double and the other with three single beds, one of which is a bunk bed. The living room includes a kitchenette with a well-equipped kitchen with running water; a bathroom with a window, air conditioning and a TV complete the furnishings of this mobile home, ideal for a family with three children or for a holiday with friends looking to stay in comfort. The outdoor veranda makes for memorable moments, surrounded by pine and juniper trees. From June to September, the use of a beach umbrella and two sunbeds in the concession area of the Cala Ginepro beach is included in the price. Discover all the features of your Bungalow in Sardinia, and all the facilities of our seaside campsite! Superior Bungalow in Orosei, in your campsite with bungalows in Sardinia! At Camping Cala Ginepro, campsite with bungalows in Sardinia, the Superior Bungalow is a newly acquired mobile home that has a double bedroom and a triple bedroom with three single beds, two on the ground, and one bunk bed. Ideal for five people, the Superior Bungalow includes a weekly linen service; it also offers a living room with a little sofa, a table and chairs, a 4-burner gas stove, an external gas tank, an electric oven, a fridge freezer, and a well-equipped kitchen. A bathroom with a shower, a toilet and a sink and an outdoor veranda with a table and chairs complete the comforts. The Superior line is the right choice for a group of five people looking for an open-air holiday in Sardinia with all the comforts, in a campsite overlooking the sea. bedroom with three single beds, two on the ground, and one bunk bed; weekly change of bed linen. bathroom with a hot shower, toilet, and sink; weekly change of bath linen.